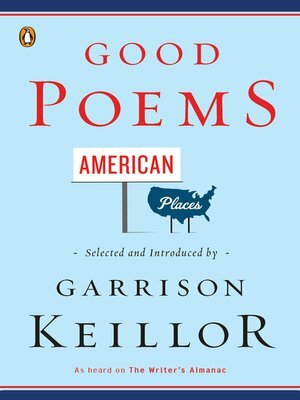 P> Another wonderful poetry anthology from Garrison Keillor-rooted in the American landscape. Greatness comes in many forms, and as Garrison Keillor demonstrates daily on The Writer's Almanac, the most affecting poems in the canon are in plain English. Third in Keillor's series of anthologies, Good Poems, American Places brings together poems that celebrate the geography and culture that bind us together as a nation. Think of these poems as postcards from the road, by poets who've gotten carried away by a particular place-a town in Kansas, a kitchen window in Nantucket, a Manhattan street, a farm in western Minnesota. Featuring famous poets and brash unknowns alike, the verses in this exhilarating collection prove that the heart can be exalted anywhere in America.